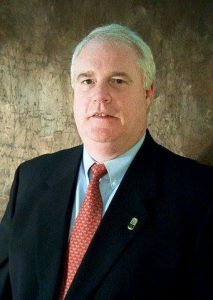 This week’s featured board member is Skip Balkenbusch. Skip joined our board last year, but his family has been involved with FWCC for many years. His son Corey, a member of the Youth Chorale and Chamber Singers, has been in the choir for 8 years. Skip grew up in Fort Wayne and attended Northside High School and IPFW. He was a member of the All City Choir, an organization that preceded the FWCC. He did a short stint on the trumpet and cello, followed by absorption into the football collective, but he remained active in all high school singing opportunities, including choir, barbershop quartet, folk group, a Chamber Choir equivalent, rock group and others. He sang in such famous venues as his shower and the car. 1- How long have you volunteered for FWCC? I joined the board formally last year, and prior to that I volunteered every time my wife or Jonathan told me to. 3- What were you most surprised to learn about FWCC after getting involved? The upside to the technical quality of the music has been very cool. 4- Why do you think FWCC is important to our community? Any youth organization that teaches team play, reaching for excellence, a dab of leadership and reinforces self-esteem is incredibly important as a broad set of values relevant to society. 5- What is your favorite FWCC memory? Hearing music enjoyed by my father, sung by myself when I was a young adult, then sung by today’s choir in incomparable quality. Often this evokes tears.